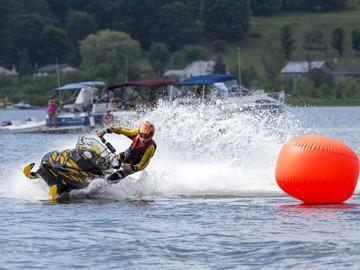 Watercross Racing is coming back to Tweed! After a very successful 2016 event The Ontario Watercross Racing Association is excited to Kick off the 2016 season Stoco Lake this June! Call 1-866-844-1483 for Camping Registration and Spectator Info. First things first, you've got to see this to believe it! Of course there's plenty of other mods the pro racers make, but that's all you'll need to get started. Pro racers? Running snowmobiles on water? Well yes, look no further than the Ontario Watercross Racing Association. Yes, there's professional Watercross racing on through the summer now, in several classes including oval and drag racing. And big snowmobile manufacturers like Ski-doo and Yamaha are kicking in sponsorship dollars to help the sport along. Interestingly, the front skis aren't really used for steering; they're generally lifted out of the water by the huge power of the scoop belt drive. Instead the racers steer their snowmobiles using bodyweight and a technique similar to waterskiing. We like the sound of the Icelandic variant as well - where you're not allowed to modify your snowmobile, and the winner is the last guy to sink. What a great spectator sport that would be! It's always fun to hear about the innovative ways that lunatics all over the world find to punish various machinery in pursuit of a rush - and even better when a crazy idea like Watercross takes the step into being a pro sport we can all enjoy. Nice one, guys!